This coffee table features the collection’s signature flared legs. The rectangular top paired with the curve of the legs make this table unique. With two drawers and a compartmental shelf this table also provides storage for important items like books or media accessories. 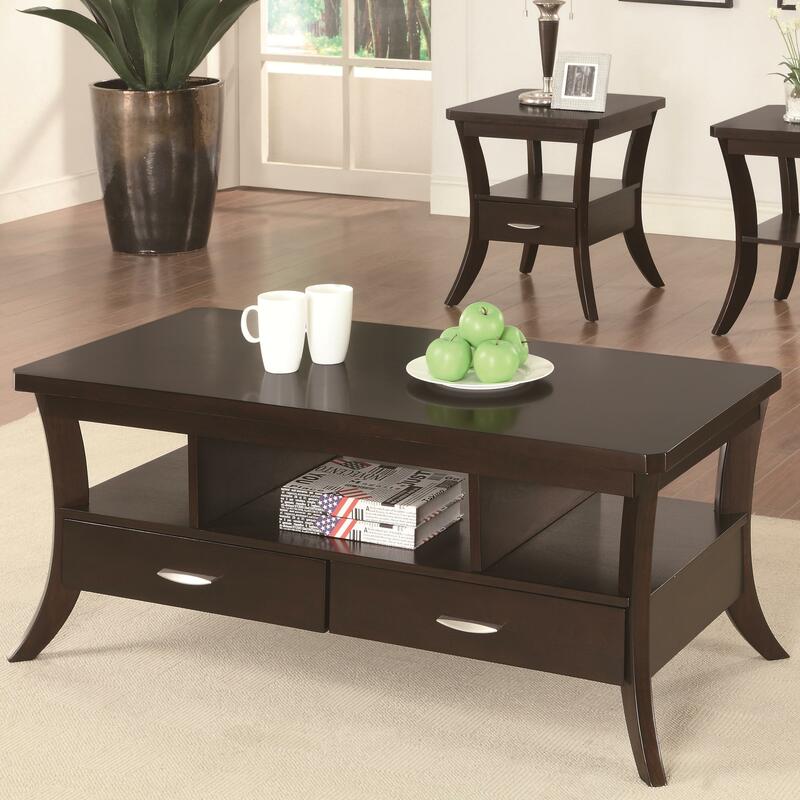 This coffee table is sure to complete the look of your sophisticated living space. The Occasional Group Coffee Table with Flared Legs and 2 Drawers by Coaster from Nashco Furniture - Nashville. We proudly serve the Nashville, Franklin, Brentwood, Clarksville, Green Hills, Davidson County, Williamson County, Tennessee area. Product availability may vary. Contact us for the most current availability on this product. Finish & Paint Options Espresso finish. Handles & Hardware Silver hardware on drawers. Case Detail Feature flared legs. 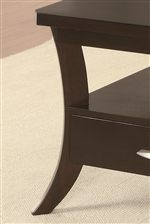 This contemporary occasional group provides the tables you need for storage while also showing off your modern style. The dark espresso finish is accented beautifully with the simple, linear hardware. The curved legs add a dramatic flair to each simple piece. Together the coffee table and end table come together to complete the modern look you want showcased in your home. The Occasional Group collection is a great option if you are looking for Contemporary furniture in the Nashville, Franklin, Brentwood, Clarksville, Green Hills, Davidson County, Williamson County, Tennessee area. Browse other items in the Occasional Group collection from Nashco Furniture - Nashville in the Nashville, Franklin, Brentwood, Clarksville, Green Hills, Davidson County, Williamson County, Tennessee area.